In 1955, Jenny Van Horne was a 21-year-old, naive Bennington College graduate on her own for the first time in New York City. She meets 46-year-old Clement Greenberg who, she is told, is "the most famous, the most important, art critic in the world " Knowing nothing about art, she soon finds herself swept into Clem's world and the heady company of Hans Hofmann, Willem de Kooning, Franz Kline, David Smith, Helen Frankenthaler, among others. Seven months later, as a new bride, Jenny and Clem spend the summer in East Hampton near Jackson Pollock and Lee Krasner, and she feels even more keenly like an interloper in the inner circle of the art scene. A woman disowned by her anti-Semitic family for marrying a Jew, she would develop a deep, loving bond with Clem that would remain strong through years of an open marriage and separate residences. Jenny embodies the pivotal changes of each passing decade as she searches for worlds of her own. She moves from the tradition of wife and mother to rebellion and experimentation; diving into psychoanalysis; the theater world of OOB and the Actors' Studio; and succeeding in business. 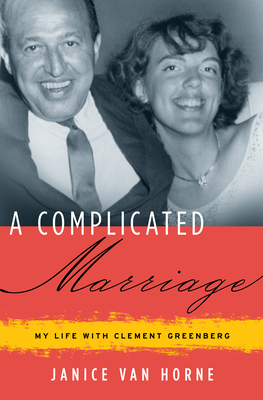 Throughout, A Complicated Marriage is grounded in honesty and the self-deprecating humor, grace, and appealing voice of its author. In recent years Janice Van Horne edited two books assembled from Clement Greenberg's archive at the Getty Research Library; The Harold Letters and Homemade Esthetics, designated a New York Times book of the year. She lives in New York City, in the same apartment she and Clem moved into in 1960.